Each time we plug in a thumb drive, the PC will assign a letter to it. But, what if we plug more than one thumb drive? How are we going to know which one is the one we that want just by looking at the drive letter. Fortunately, Windows enable us to give the thumb drive a name. 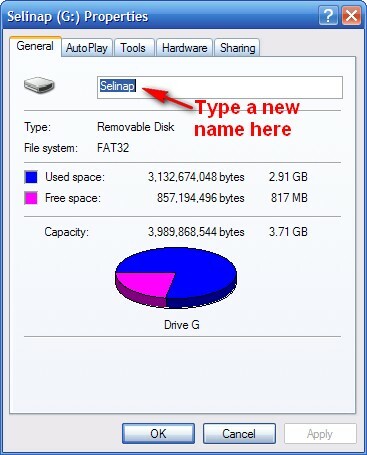 To give the thumb drive a name, right click on the drive letter, and choose Properties. In the Properties windows, we can change the name, as shown in Figure 1.